Stark white is brought to life with gorgeous interior patterns in this home belonging to stylist, Susanna Vento. 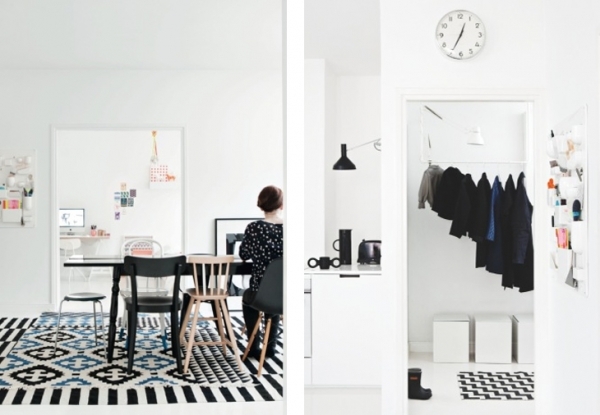 The home which is mainly black and white, incorporates color and detail into its design through the use of multiple patterns. The combined dining room and kitchen is absolutely fantastic. The kitchen has modern white cabinetry and a realistic drawing of a tiger. Separating the two spaces, an attractive vintage refrigerator, adds a bit of comfort to the space. The dining area is positively sublime with its unique black dining table and its magnificent variety of chairs. The white chair, dipped in bright blue, is especially gorgeous. Interior patterns are smartly used in this room, creating eye-pleasing interest. The grid chairs with patterned pillows and the multiple patterned rugs look great in the space. The layered rugs are a fantastic creative design choice, adding uniqueness to the home decor. Interior patterns continue in the office space, albeit to a lesser degree. 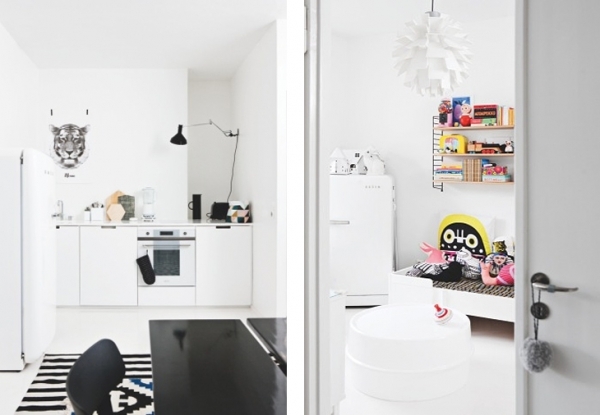 The stark white area adds patterns through the artwork, storage, and waste basket. This is definitely a minimal approach, but it continues the gorgeous theme of the house. The master bedroom has a large bright white bed, a beautifully patterned throw, and a clean-lined shelf. A ceiling light with two different colors of intertwined rope, hangs over the bed, providing lighting, and its own spectacular pattern. Gorgeous pieces of art, a television, and bright white storage space, sits across from the bed, completing the room. The interior patterns in this room play well together, creating a cohesive and alluring bedroom. 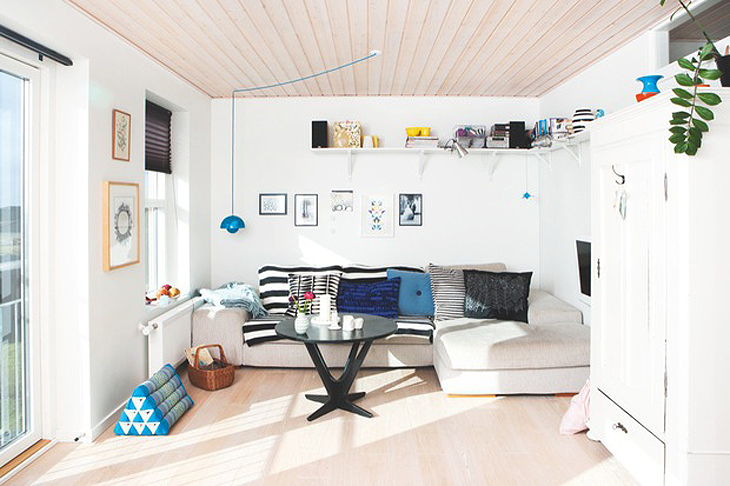 We love the creative design choices made in this adorable home. The stark white interior and patterned decor is captivating and unique. 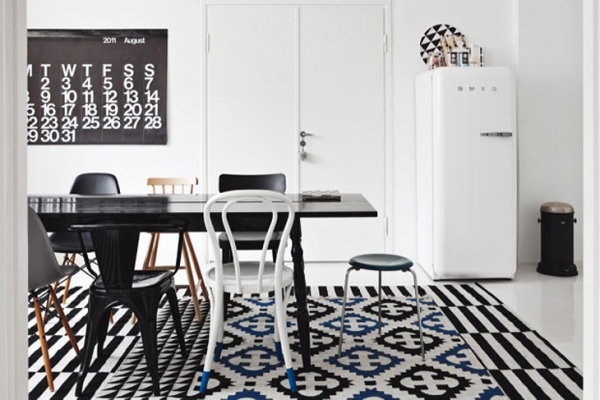 The rug layering is especially enticing. It adds a fantastic flair to the home. An exciting and ingenious space.